This is the story of how one unicorn-obsessed girl became a a children’s writer, a playful productivity coach, and a busy creative mama. It all started with my beloved stuffed unicorn, Henrietta. (Because every heroine needs a wise old mentor.) When my middle sister and I were little, and we were supposed to be asleep, I used to tell her stories in the dark: epic tales of the doings of Henrietta’s long-ago unicorn ancestors. Then, around the time of my ninth birthday, I came upon a dusty old copy of a book called The Magic of Thinking Big. After reading it, I decided to set an audacious goal of my own. I was going to write a book about the unicorns. Eighty handwritten pencil pages and two years later, I had my first completed manuscript. There were quests, magic spells, love affairs, betrayals, tragic deaths, and convenient suspensions of the laws of physics. I still have that old spiral notebook to smile (and giggle and cringe) over. And I still have Henrietta too— floppy, dingy, and very much Velveteen-Rabbit-Real. These days, I’m writing a lot less about unicorns than I did at at age nine. But that’s only because I’m writing about space fairies + dragon pirates instead. I’m currently hard at work on my children’s writing projects. I’m still fascinated by goals and making them happen, too. My other area of work is playful productivity: the art of making time + finding energy for more of the work that matters most… and setting up just-right tools + processes for creative people with busy lives + big goals. I also have a very personal perspective on the struggles of my fellow busy parents. Having children honestly turned all my notions about productivity + time management upside-down, sideways and every other angle you could imagine– and I believe I am emerging the wiser for it, if more sleep-deprived than I’d expected. 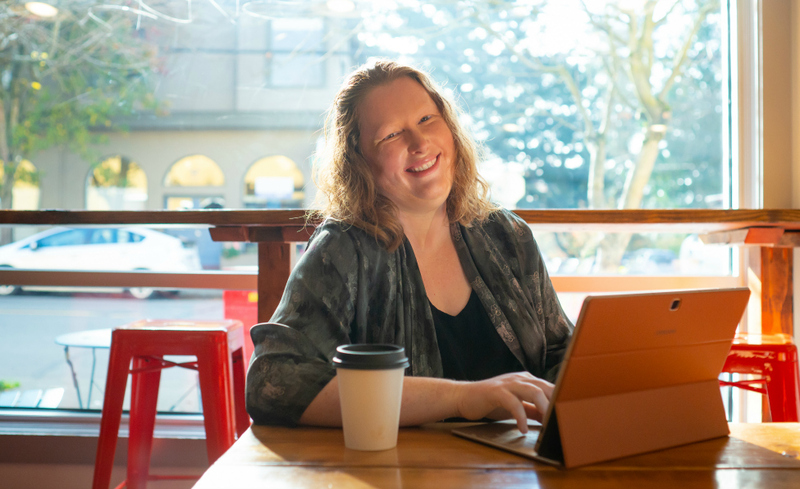 So that’s me… writing + coaching + parenting here in Seattle. With a ukulele kicking around somewhere nearby and lots of coffee at my elbow. I hope you stick around + let me get to know you, too. 1. I listen to all kinds of music, but lately you can always find lots of upbeat Celtic jigs and reels on my playlist. Next month it might be back to the Indigo Girls or 90s alt-rock, or perhaps I’ll find something new. 2. I am in love with my ukulele… and just okay-ish at playing it… and that is just fine with me. The simple chords lift me up so I can sing from the heart. And when I sing, I feel at one with something powerful + right in the world. 3. I believe in laughing with my problems, whenever I possibly can. It doesn’t solve everything, but it can help– seeing glints of humor in places light and dark opens me to new possibility. 4. My children are, of course, the delight of my heart… and they remind me of what truly matters most. Plus, they can always be relied upon to keep things interesting. 5. My devotion to the coffee bean runs deep, but my body has insisted I switch to decaf. Sometimes I wonder about this whole getting older deal. But as they say, it beats the alternative, right?